See Rubus idaeus L. subsp. vulgatus for a description. The ‘Common Red Raspberry’ is the wild type. 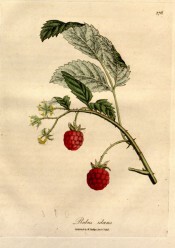 The ‘Common Red Raspberry’ was described by Don as a worthless red fruit. Listed in all catalogues as ‘Common red Raspberry’ [Raspberry no.1/1843].